Given it seems like professional athletes the world over seem to go to the same school of clichés when it describing their game, it is refreshing indeed to come across a business that has really got game, both figuratively and literally. Based in Quebec City, the 11,000-square-foot facility of Les Gibiers Canabec Inc. opened its doors in 1985 as the first game meats distributor in the province—the term ‘game’ referring to any animal typically hunted for sport or for food. In this case, however, the animals harvested are raised in farms, both locally and elsewhere. 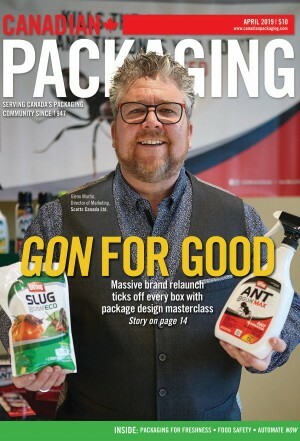 “We specialize in the processing and distribution of all available national and international game,” explained Gibiers Canabec president and co-owner Alexandre Therrien to Canadian Packaging magazine during a recent interview. The animal species most processed by Gibiers Canabec are red deer, bison, wild boar, elk, guinea fowl, rabbit and quail, with Therrien acknowledging that its duck rilletes—prepared similar to pâté and formed in a duck-shaped mold— is its biggest selling product. 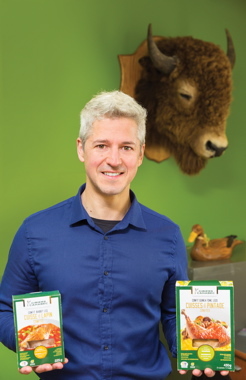 Holding packs of rabbit leg confit and confit guinea fowl legs, Les Gibiers Canabec co-owner and president Alexandre Therrien’s runs a high-end business serving 12 different kinds of game meats to its retail and restaurant customers. “Our recipe is very tasty, and by utilizing a the duck-shape we have created a memorable way to differentiate our product and to really grab the customer’s attention,” he explains. Employing about 80 staff—depending on the season—Gibiers Canabec processes and packs 15,000 kilograms of meat and poultry products per week on average, though Therrien acknowledges that those numbers can soar by 350 per cent up to 52,500 kilos per week in the month of December in anticipation of the Christmas rush when sales are the greatest in December. According to Therrien, preparation for that peak season gets rolling as early as September, with everyone expected to put in some overtime—including administration staff and even Therrien himself. “It’s so busy that I will usually spend a solid three weeks out on the production floor,” Therrien reveals. “It’s something I hope my employees appreciate—seeing me do some ‘real work’ alongside them. 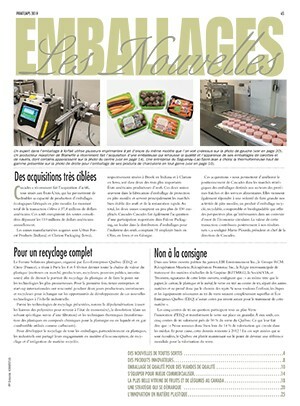 “We have close to a thousand SKUs (stock-keeping units) of finished products—raw and cooked sausages, wild boar bacon, terrines, liver mousse, foie gras parfait, portioned meat for various stews, ground meat, fondues, steak and portioned medallions,” notes Therrien, describing the company’s truly unique product range. For fondue lovers who have only ever experienced bread with melted cheese or chocolate, Gibiers Canabec provides more exotic offerings, building on a more hearty product range typically found on Quebec dinner tables. When Gibiers Canabec began producing the fondue for retailers in the province—thinly slicing the meats to a 1.5-mm thickness and preparing a flavored Bouillon dipping broth for the meat, beef fondue was the only version available at the time. “But nowadays, the popularity of the product has allowed us to offer 12 different kinds of meat: deer, bison, elk, wild boar, ostrich, kangaroo, duck, guinea fowl, camel, lamb, goose and rabbit,” relates Therrien. “We specialize in the distribution and processing of meat from local game, as a priority, and international where necessary,” he notes. Although the supply of game and poultry for Gibiers Canabec is mainly local from within the province of Quebec, Therrien notes he also purchases bison and elk from western Canada, while ostrich, kangaroo and camel meats are purchased direct from suppliers in faraway Australia. Therrien explains that the company built its own distribution network with its sales force, providing a direct delivery service with the company’s own trucks to get the products to restaurants, caterers, butchers, specialty grocers, and supermarkets like Sobeys and Metro. “The company’s strength is built on a foundation of two key elements: transforming exotic meat products according to customer tastes while offering a wide variety and availability of cuts, cooked dishes, confits, terrines and cold cuts,” explains Therrien. “The other part of our game plan is to provide chefs a wide variety of fresh game meat with a high reliability of supply each and every day,” he adds. Although working to the demands of professional chefs can be a daunting challenge, Therrien is fortunate to have a bit of experience in that regard under his belt. Therrien’s father Laurier—a Gibiers Canabec shareholder but now retired from the day-to-day operations—opened up the renowned CAA (Canadian Automobile Association) five-diamond-rated The Lair restaurant in 1978 in Ste-Foy, about 20 minutes outside of downtown Quebec City. Together with his wife Chantal Miclette, Laurier Therrien prepared exquisite meals consisting of local fine meats and poultry, preparing them with the keen eye of a highly-skilled chef well-respected throughout the province. “Along with his cooking skills as an award-winning chef, my father was also a big-time nature lover, hunter and fisherman, who handed down his passions to my cousin Karen and to myself and my team here at Gibiers Canabec. 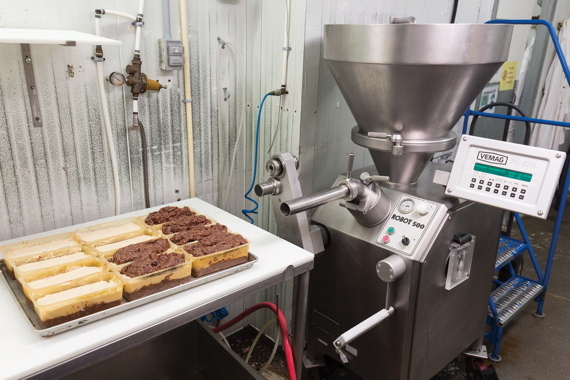 Workers place chubs of bison meat through a Holac industrial slicer and then hand-place the fondue slices on the film tray fed to the Repak RE15 form/fill/seal packer. 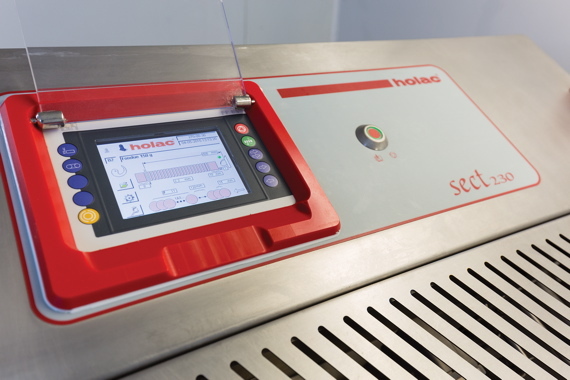 A close-up of the easy-to-use touchscreen operator control panel on the Reiser-supplied Holac Sectomat 230 industrial slicer used by the Gibiers Canabec processing plant. Therrien says his father saw initially the opportunity to open Gibiers Canabec back in 1995 as a means to distribute high-quality game meat to other restaurant chefs, but he has since worked hard to expand the scope of the business to include retail products. Producing a perfect seal every time, the Repak RE 15 thermoformer purchased by Gibiers Canabec is a custom-designed machine that was intentionally shortened by 300-mm to accommodate the placement of a Holac Sectomat 230 industrial slicer at the front end of the machine. 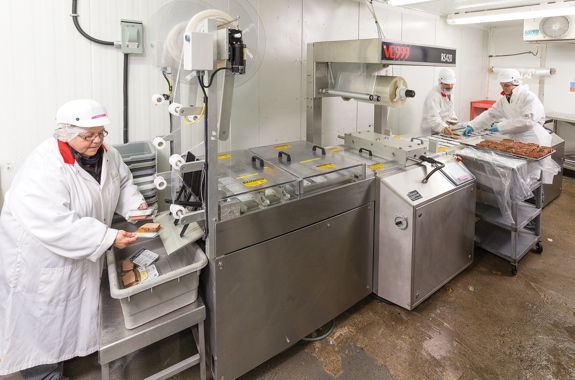 For Therrien, one of the main challenges facing Gibiers Canabec was how to develop and prepare a packaged product that could maintain the freshness of the original meat or poultry. “Also, since the animals we were going to prepare and offer for sale were only in season for certain parts of the year, how could we offer our products without fail every day of the year? While bringing a more exotic meat or poultry dish to the dinning room table was all very good, ensuring it was healthy was just as critically important, Therrien points out. “We understand that sometimes it can be difficult for people to prepare good meals on a daily basis while espousing variety, so we created a wide range of products while taking the health and welfare of the consumer at heart: ensuring they were all gluten-free products,” extols Therrien. 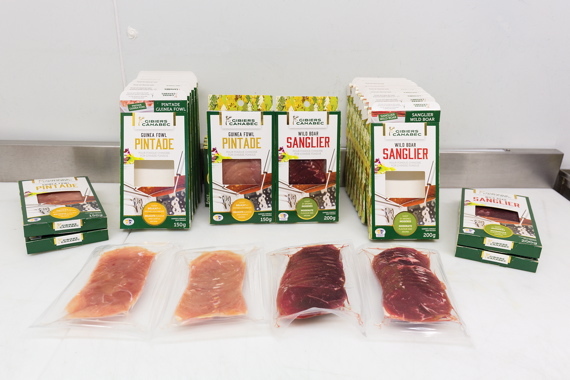 Gibiers Canabec produces canapés appetizers via its terrines and smoked products, along with raw and cooked meats for meals, even marketing a range of speciality sauces for its various meat products. “We certainly have something that will satisfy your needs,” says Therrien. A sampling of the high-end game and fowl products vacuum-packed by the Gibiers Canabec plant’s compact Reiser Repak RE15 horizontal form/fill/seal thermoformer. The health aspects of his products are not lost on Therrien, as he strives to ensure that every product Gibiers Canabec produces meets strict guidelines. “We certainly have nothing against the inclusion of consuming other animal meats, but there is a lack of education in people when it comes to the so-called ‘exotic fowl’ like goose or game meats,” begins Therrien. Therrien says that contrary to popular belief, duck fat is actually a health benefit, being heavy in monounsaturated fats that some medical researchers indicate could actually help improve the cardiovascular health in humans, while also helping in the production of insulin to help stave off the onset of diabetes. As the popularity of Gibiers Canabec products continued to grow, finding more production space became an urgent priority. After expanding the facility twice, ultimately no further expansion became possible. 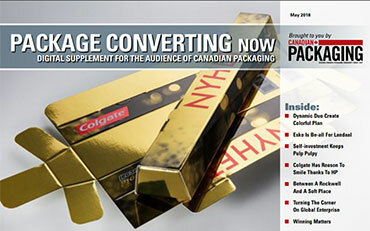 A layered mousse product is created via a Vemag Robot 500 vacuum filler distributed by Reiser Canada, equipped with double-screw technology. Not ready to move lock, stock and barrel into a new facility, in 2012 Therrien decided to look internally for a solution: how to become lean by optimizing the company’s operational efficiency to increase both production capacity and productivity. 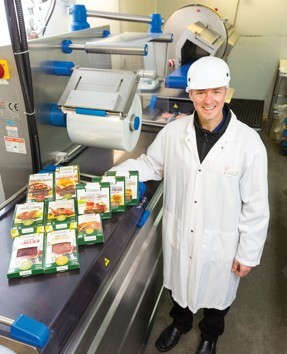 Workers at the Gibiers Canabec processing plant use a VC999 RS420 rollstock thermoformer to pack the company’s popular Porto Liver Parfait product. 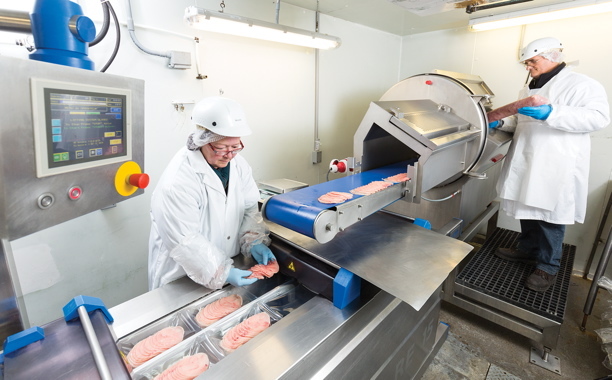 The provincially-inspected facility features what Therrien calls “an excellent quality control system” based on HACCP (Hazard Analysis and Critical Control Points) food safety management protocol. “Up to now, we have only concentrated our efforts into growing our market within Quebec for reasons of supply, knowing that there is a higher demand here for game meat than elsewhere in Canada,” relates Therrien. “We know that demand could easily outweigh supply, so we are wary of that. “Our medium-term expansions plans include us becoming involved in a larger geographic market, which we know is key in the eventual evolution of Gibiers Canabec as a company,” he explains. 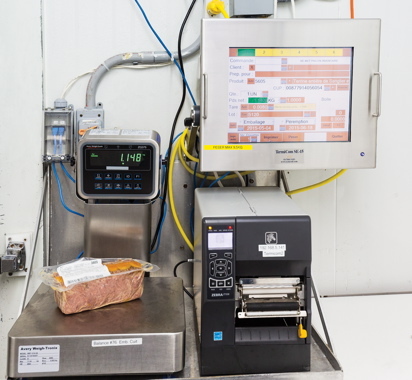 Gibiers Canabec uses an Avery Weigh Tronix combination package weighing and labeling system to provide accurate product information disclosure for its customers. Although the company does distribute other brands—such as foie gras for Rougie—it does not do any third-party manufacturing or co-packing, preferring instead to focus on its own Gibiers Canabec brand in terms of processing and marketing. Along with a keen eye towards only providing the highest-quality game and fowl available, the company is also keen on ensuring it is processes and packages its value-added, high-quality products a fitting manner. 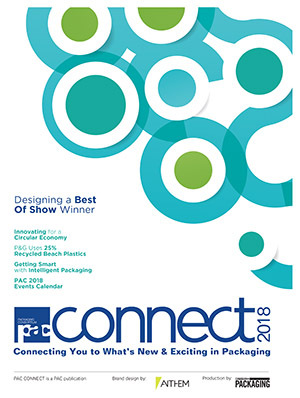 Citing the tight floorspace confines, Therrien says that Reiser Canada was the only equipment supplier who was able to provide a turnkey solution with the two machines it required—a slicer and a horizontal form/fill/seal thermoform packing system. 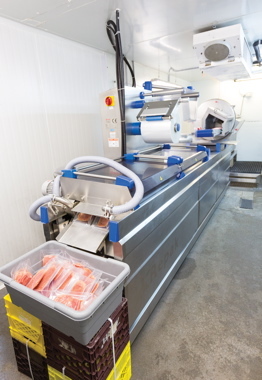 Installed in October of 2013, Reiser supplied Gibiers Canabec with a new Holac sectomat Sect 230 slicer—designed for total hygiene and easy sanitation cleaning—and a Repak RE15 system to thermoform-pack its Chinese fondue and burgers, as well as produce vacuum-packs for cooked products such as rabbit legs or guinea fowl confit. Capable of slicing speeds of up to 400 cuts per minute, the Sect 230 slicer includes an electronically-controlled product infeed to produce clean, high-accuracy slices of the Gibiers Canabec fondue products. Standing beside the Reiser Repak RE15 thermoformer is the Gibiers Canabec fondue department team (from left): Michèle, Diane and Yves, production manager Richard Desrosiers, CEO Alexandre Therrien, and operations manager Marie-Pier Cote. 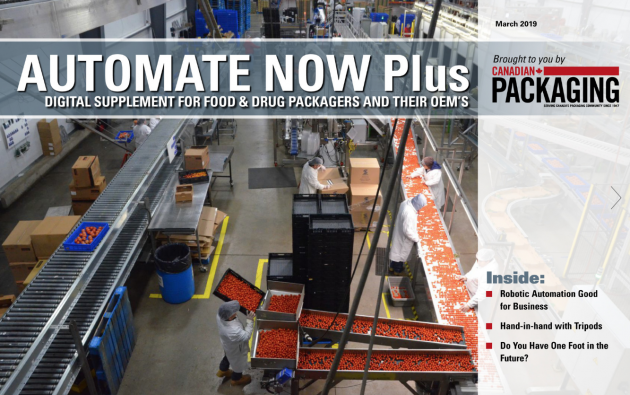 Prior to purchasing this system, Therrien explained to the Reiser team that he was looking to alter the way his products were being presented, namely upgrading from the existing present vacuum-pouch packaging format. After a thoughtful evaluation, Reiser offered Gibiers Canabec a packaging machine that could provide it with exactly what it needed now, with built-in design capacity to accommodate many more future packaging options. The Reiser range of Repak machines can produce vacuum and modified-atmosphere packages from flexible and semi-rigid materials, as well as Vacuum Skin Packages (VSP), and packages with formed top webs. Reiser first visited the facility in June of 2013, fully aware that the target installation date was September, which Therrien says was right on the eve of its high production period. • A TermiCom SE-15 fully water-proof computer system with scratch-resistant, 15-inch color touchscreen manufactured by the Victoriaville, Quebec-based Symcod. “The weighing stations are connected with our computer system—allowing us to track our inventory in real time,” says Therrien, adding that computerizing the assembly and shipping of all products was the major project of Gibiers Canabec in 2014. Therrien says he is also quite proud of the packaging of his products—especially on Gibiers Canabec’s new Guinea Fowl Pintade packaging. “The forest artwork on the sides is part of our brand territory now,” he says. “The artwork is actually representative of a boreal forest, which reflects us perfectly. These new packs are designed as hanger-packs that can be hung on pegs inside a refrigerator. No longer lying flat on top of a shelf, these high-quality meals and its packaging now face the consumer, directly eye-to-eye, instantly grabbing their attention as they pass by in the grocery aisles. Despite the intriguing nature of its products, Therrien is adamant that his so-called niche market is hardly all that niche. “People often think that we have little or no competition,” he relates, “but that’s just not true. Over the past seven years, Therrien says the company has doubled its business sales, crediting the close relationships it maintains with its customers, as well as remaining very active in the development of new products. “We have been open to developing new partnerships with our suppliers and customers,” he says. “Last year we reviewed and then reworked all of our branding, and then began to invest more seriously in publicity for our products. Therrien says he is highly motivated by the glowing reviews he receives from his customers, some of whom have been with Gibiers Canabec for over 25 years. “Along with those rave reviews, the customers say that it appears as though we make a real effort to produce products that really stand out, with flavors that virtually ‘explode’ on their tastebuds. “We’ve been told that our products show our expertise in the art of fine dining,” he concludes.